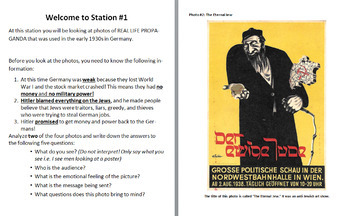 In this lesson students will be able to explain how Hitler used propaganda to turn German citizens against Jewish people. Students will do this by analyzing images, articles and video clips at 4 different stations. There is a graphic organizer included which all students can use or can be used as means of differentiation (student work is also translated into Spanish for ESL students). As an introduction to how propaganda is used, students will watch a short video that demonstrates how easy it is to destroy unity by turning one group of people into 'others'. 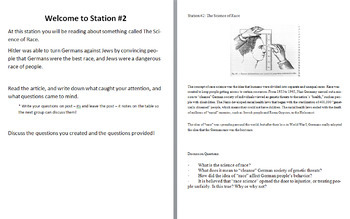 Students will also read and analyze a short excerpt about the dangers of a 'single story' and how Hitler's single story about Jewish people allowed the Holocaust to take place.